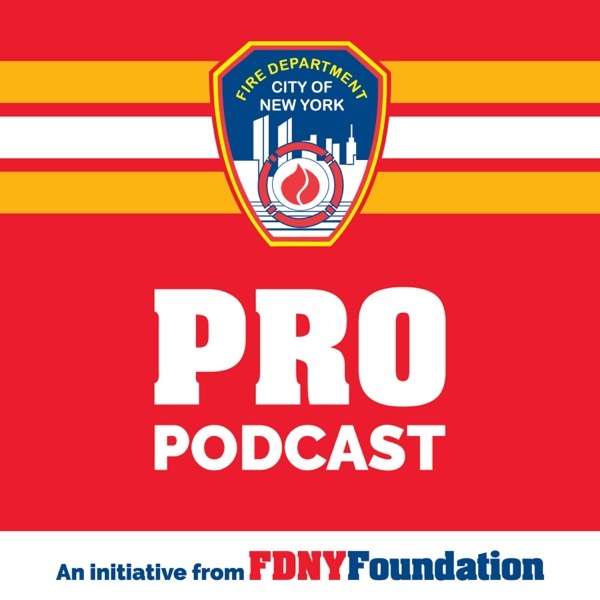 The FDNY Pro podcast brings together professionals and experts in the field of Fire and EMS, offering their firsthand knowledge and experience. Hear from the pros as they discuss what they’ve learned on the front lines. FDNY Chief Joseph D. Liselli recounts response measures and operations during the 2016 Chelsea bombing. Lieutenant Jon Paul Augier hosts. FDNY Lieutenant Yonatan Klein discusses how the FDNY researches, develops and selects the best tools and equipment for members. Lieutenant Farooq Muhammad hosts. FDNY Captain Charles Fraser details how to maximize and expand your resources for a mass casualty incident. Lt. Farooq Muhammad hosts. FDNY Lieutenant Stephen Rhine sits down to discuss the intricacies of operating at emergencies in air-supported structures, an increasingly popular form of construction. Lieutenant Jon Paul Augier hosts. FDNY Captain Frank Leto describes how the FDNY Counseling Service Unit’s Peer Support Groups support all members with an array of services. Captain, and Executive Officer to the Fire Commissioner, Elizabeth Cascio hosts. FDNY Captain Chris Ward discusses the role that intelligence plays for first responders, including how the FDNY keeps terrorism awareness on the front lines through its weekly intelligence product, Watchline. Captain Sean Newman, of the FDNY Center for Terrorism and Disaster Preparedness, hosts. FDNY Chief Medical Officer Dr. Kerry Kelly and FDNY Attending Cardiologist Dr. Dianne Acuna discuss how to recognize heart disease as well as the effects that heart disease has had on the first responder community at large. Lieutenant Jon Paul Augier hosts. FDNY Lieutenant Farooq Muhammad reaches over one million views for his video, “EMS Anthem,” and discusses what inspired him to create music about the job he describes as a calling. Captain, and Executive Officer to the Fire Commissioner, Elizabeth Cascio hosts. FDNY Firefighter and US Marine Corps Major Jason Brezler describes the FDNY’s new Mental Performance Initiative by detailing his experiences on the battlefield in the Middle East and on the fireground here in New York City. Lieutenant Jon Paul Augier hosts. Chiefs Jay Jonas and Brian Mulry recount operations, decisions, and lessons learned while operating at a complex fire in a multiple dwelling in the Bronx. Lieutenant Jon Paul Augier hosts. Firefighter Anthony Caterino describes the importance of the FAST Unit in maintaining firefighter safety during an emergency operation. Chief Jay Jonas joins the conversation detailing his past experiences being deployed as a FAST Unit Captain during a rope rescue. Lieutenant Jon Paul Augier hosts. Deputy Assistant Chief Olszewski recounts her experiences as a then-newly promoted EMS Captain. She discusses the decisions that guided staging, triage, transportation and other considerations for EMS operations on 9/11. Captain, and Executive Officer to the Fire Commissioner, Elizabeth Cascio hosts. Lieutenant Robert Brown discusses some of the effects of stress on the body during fire operations, including auditory exclusion. He walks listeners through the body’s response during a highly stressful event and offers suggestions for countering unwanted physical responses to stress. Lieutenant Jon Paul Augier hosts. Lieutenant Joseph Yolles discusses the importance of training personnel who operate emergency vehicles. He describes in great detail how FDNY administers its training program to ensure safe operations on New York City streets. Captain, and Executive Officer to the Fire Commissioner, Elizabeth Cascio hosts.